Back cover blurb: Before you follow the path into your family’s history, beware of the secrets you may find… The new novel from the Sunday Times bestselling author. Before you follow the path into your family’s history, beware of the secrets you may find… The new novel from the Sunday Times bestselling author. The past is about to become the present… Ruth has returned to Edinburgh after many years of exile. Left rootless by the death of her estranged father, she is faced with the daunting task of sorting through his possessions. Amidst the dust of her old life, Ruth discovers a hidden diary from the eighteenth century, written by her ancestor, Thomas Erskine. As she sifts through the ancient pages of the past, Ruth is pulled into a story that she can’t escape. As the youngest son of a noble family Thomas’ life started in genteel poverty, but his extraordinary experiences propel him from the high seas to Lord Chancellor. Yet, on his journey through life, he makes a powerful enemy who hounds him to the death – and beyond. Ruth has opened a door to the past that she can’t close, and meets a ghost in her family tree who wasn’t invited. 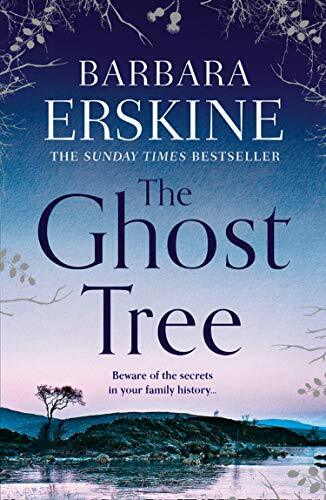 She will have to draw upon new friends and old in what will become a battle for her very survival… The inspiration for The Ghost Tree lies in Barbara Erskine’s own personal history – branching back to the days of Thomas Erskine, her great grandfather, five times removed. Once again, the Sunday Times bestselling author brings the past to life in vivid, spellbinding colour. 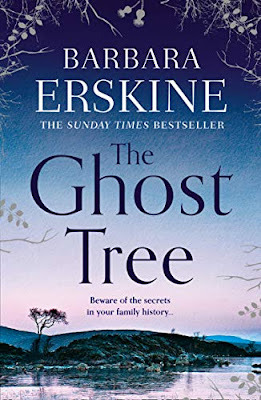 The Ghost Tree is the first Barbara Erskine novel that I have had the pleasure of reading (yes, okay I know, where have I been etc, etc...), but it's okay, because I'm pretty certain it won't be my last! The Ghost Tree is based loosely on the author's family history, and it is clear that a lot of research has gone in to this beautifully written tale. Ruth returns to Edinburgh following the death of her Father to discover that there is more family history to delve into than she ever dared to imagine. Her Mother's side of the family were much more spiritual than her Father's and Ruth had grown up without belief. As she goes through her Father's and in turn discovers that he kept all of her Mother's belongings, she realises that there is a lot more to the spiritual side of her Mother's family history, and although sceptical, she is keen to discover more about the inner power inherited through the years. Told through the perspectives of Ruth and her ancestral relative, Thomas Erskine, The Ghost Tree flips back and forth seamlessly between time periods, and make the reader feel as if they are there in the moment which each character. The Ghost Tree is more historical novel, than ghost story (perfect for me) which makes it easier to relate to for us sceptics! The paranomal element adds a subtle creepiness to the novel that doesn't detract from the enjoyment of the novel, which is gripping and hard to put down. The Ghost Tree is available now via Amazon online and all good book shops. I am delighted to be hosting this review as part of LoveReading's Ambassador Book Buzz. Thank You to lovereading.co.uk and the publishers who sent me a copy of this novel in exchange for an honest review.